I hate to admit about my initial reaction to whitening soap was not as pleasant as now if you're going to ask me. I thought of whitening soap as a nothing as an ordinary soap which claims to make your skin whiter. 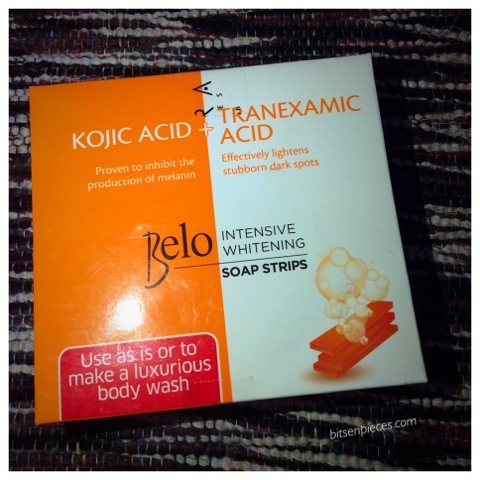 Not until I initially tried this Belo Kojic Acid + Tranexamic Acid Intensive Whitening soap sold in the market. I am not saying that this product works magical, in an instant, you'll get that whiter skin you wished for. I have tried using this soap for several times already, buying the whole bars from the supermarket and beauty stores and even ordering online. This is the first time I ordered at Zalora this Belo KTA soap strips. 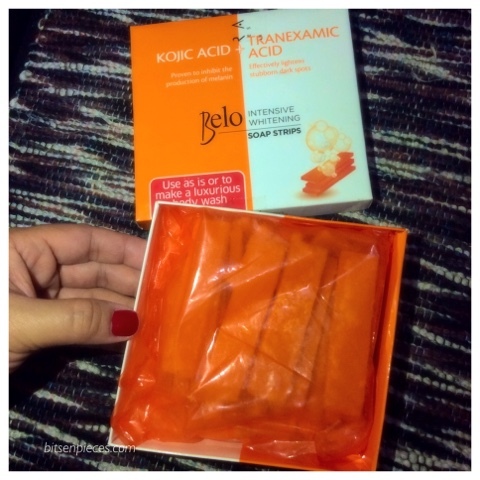 Belo intensive whitening Kojic and Tranexamic acid soap strips in an orange and white box. When you check this online at Zalora this box won't appear in the image display of the product. You will see the regular individual size Belo soap bar and the soap chips. That's why I did not have any idea how the packaging would be like. I have not opened the box yet when I took the photo of the back label of the box. 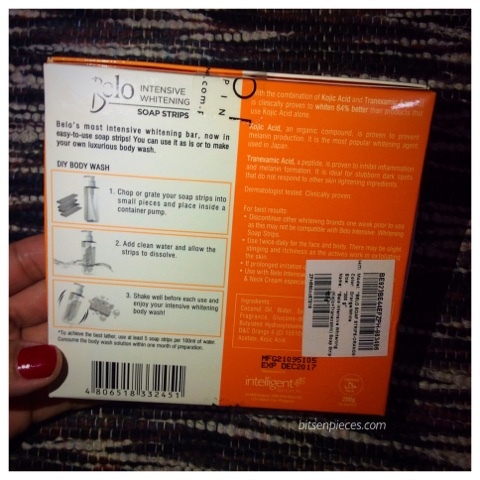 Belo Intensive Whitening Soap strips Belo's most intensive whitening bar, now in easy-to-use soap strips! 1. Chop or grate your soap strips into small pieces and place inside a container pump. 2. Add clean water and allow the strips to dissolve. 3. Shake well before each use and enjoy you intensive whitening wash. 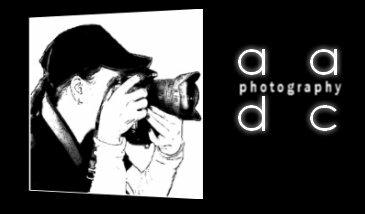 Content weight: 200 grams. 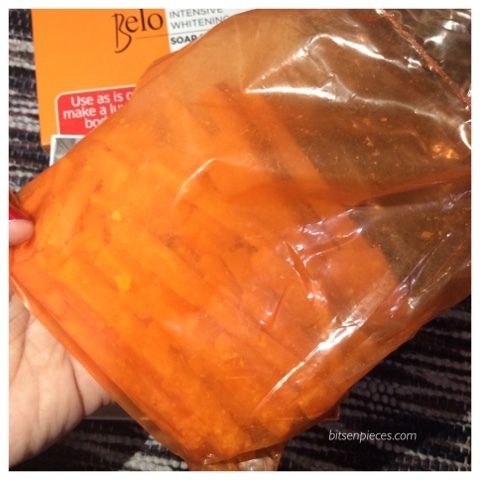 Unboxing: An orange plastic container with Belo soap strips inside. From the thorough inspection of the sealed plastic container, I saw that half of the contents in bits-en-pieces in chips and half were in strips in different sizes. This was the time I was kind of disappointed because I expected whole chip cuts. But since they suggested that it can be used as a body wash I convinced myself that the contents are still good. Exposing the contents inside, picked a couple of soap strips and this what it looks like. 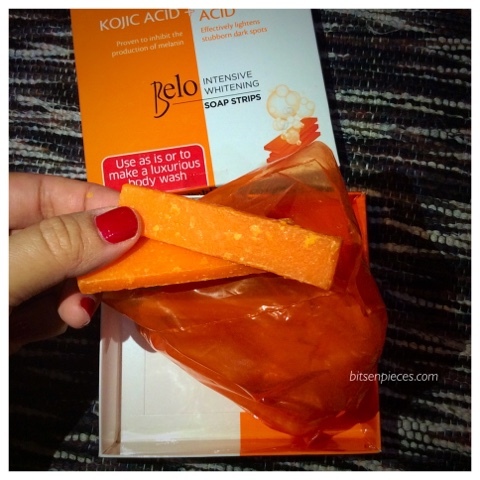 Belo intensive soap strips with an amazing fresh scent that I immediately feel like taking a bath. 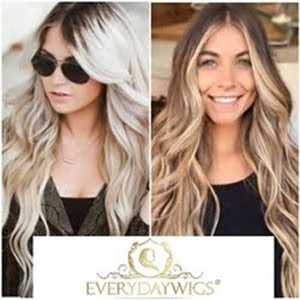 You can use any amount of strips you want depending on how you like it. In my case, I used one strip in one bath instantly rubbing the soap on your skin especially the parts you needed the most. That is just enough for me to enjoy and feel fresh. I am not expecting to have my skin whiter but I love how it lightens some skin marks all over my body. 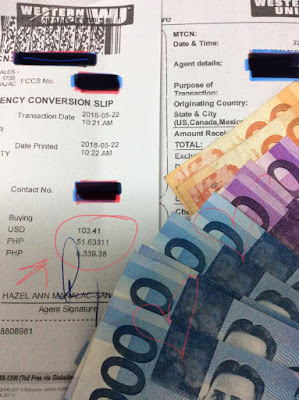 I will definitely continue using Belo soap, for only Php 120.00 per box this will last you a month use. Btw, I have tried using Silka papaya soap and Belo soap bar previously but this one stands out compared to the two.